The Wolves women ended a two-year podium drought on Saturday, capturing the bronze medal in the 4 x 400m at the 2017 ACAC Indoor Track Championships in Lethbridge. 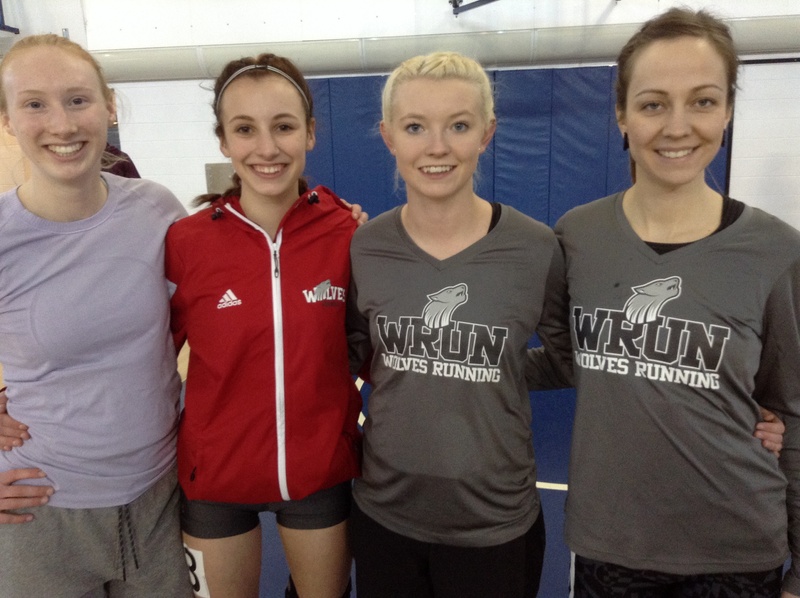 The quartet of Janai Martens, Kelsey Bishop, Brittany Duvall, and Maria Houle recorded a time of 4:26 to finish third behind MacEwan University and Red Deer College. Collectively, the Wolves women placed 6th in the team competition. Local athletes with top 10 placings in the individual events included Kailey Bratland (9th 3000m), Houle (5th 1000m and 6th 600m), and Martens (6th 300m). The Wolves men finished 5th among the male teams. Top ten placings were recorded by Brandon Wladyko (6th 3000m and 7th 1500m) and Josh Malmsten (10th 1000m). The 4 x 400m team placed 9th. This entry was posted in Indoor Track and Field and tagged ACAC, GPRC Wolves X-C Running, Indoor Track and Field, Peace Country. Bookmark the permalink.